But I have fabulous news: you can make them at home in less than 20 minutes while only dirtying one pan and one bowl in the process. So. The next time you’re hit in the face with a waft of pepper-y onion-y goodness and develop a longing for fajitas, rest assured that you can take care of that yourself. Sheet Pan Shrimp Fajitas With Chiles. When KT was a pescetarian-focused blog, a lot of my recipes were a little more complex. Not difficult, but more involved than throwing things onto a sheet pan or into an Instant Pot. Because fish and seafood are delicate, there were limitations. But shrimp! I’m so stoked that shrimp worked well for this recipe. I was originally going to create a sheet pan chicken fajita recipe, but I took a chance on shrimp and it was a total win. So much, that we had this for dinner twice in one week. If you can’t find hatch chiles, you could use Anaheim peppers, jalapeños, or omit hot peppers all together. Want an easy and mess-free dinner? 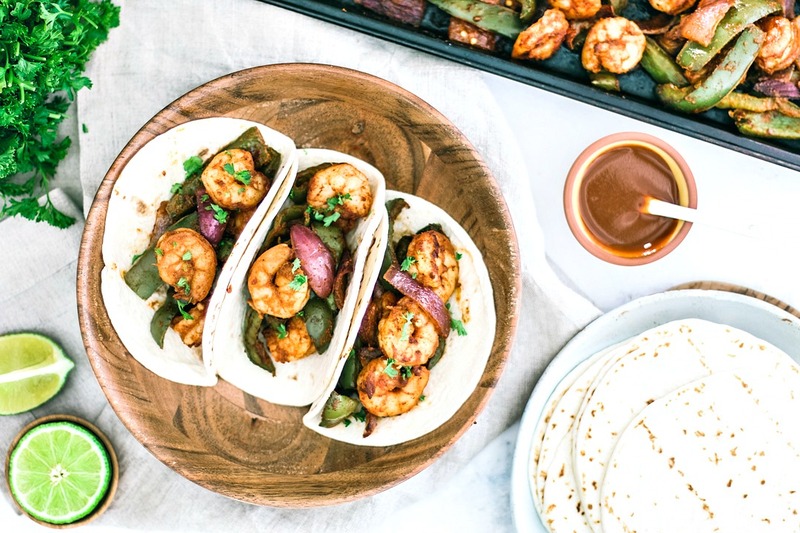 These quick and easy Sheet Pan Shrimp Fajitas are the answer, clocking in at less than 20 minutes. Prepare the shrimp (peel, devein, remove tails, rinse under cold water, and pat dry), and place them in a large bowl followed by the bell pepper, onion, and chile. Add all of the spice and, with a large spoon or your hands, toss to evenly coat all of the contents of the bowl in the spice mix. Once everything is evenly coated, dump the contents of the bowl onto a sheet pan and spread everything out in an even layer. Place in the over, middle rack, and bake for 8-10 minutes; carefully toss everything with a large spoon or spatula halfway through cooking time. Remove the pan from the oven when everything is cooked, and serve fajitas with flour tortillas and your choice of garnishes and condiments.